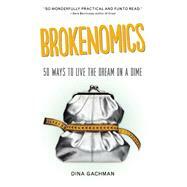 Dina Gachman’s comedic blog about the economy, Bureaucracy for Breakfast, has been featured on Marketplace on NPR, ABC’s 20/20, and Chelsea Handler’s Borderline Amazing Comedy. She writes for Forbes, Salon, Hello Giggles, The Hairpin, xoJane, and Interview Magazine, and she has published two comic books, about Marilyn Monroe and Elizabeth Taylor. The Los Angeles Review of Books called the Marilyn comic a sensitive, celebratory ode to Monroe.” Gachman has a BA in English from UCLA and an MFA in Film Production from USC’s School of Cinematic Arts. She was born and raised in Texas, and lives and writes in Los Angeles. 12. Don’t Sell Your OrgansYou Need Those! 13. It’s Not Just a Coffee Shop. It’s an Experience. 15. What’s So Funny About Taxes? Nothing. So Let’s Just Get This Over With. 40. So You Want to Major in Philosophy? Don’t.